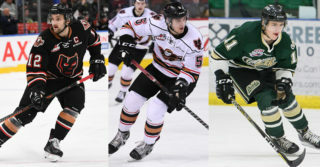 Jack McNaughton stepped into his first taste of WHL action Monday afternoon against the Prince Albert Raiders just halfway through the second period and wasted little time to make an impression. Simply put, he was dialed in. “It was an unreal experience,” he said. 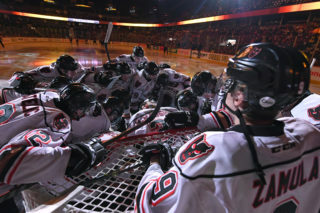 “It was surreal playing on Saddledome ice for the first time in my life and something I won’t forget. The 17-year-old rookie goaltender stopped all 12 shots fired his way in a little over 28 minutes of action which included a pair of breakaway saves. With one of them being his first very shot against. “It was tough having your first shot be a breakaway,” he said. “I just stayed calm and composed and grew more confident as the game went on. I knew that I had to take each shot once at a time and focus on what I needed to do and where to be positioning wise. 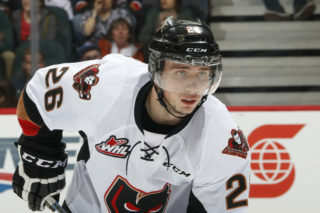 Prior to getting into game action, McNaughton was a listed prospect of the Hitmen and headed into training camp eyeing a roster spot. The Calgarian was solid all camp and pre-season making it an easy decision for him being named to the opening night roster and sticking with the club ever since. “I don’t think it’s really hit that I am here yet,” he said. 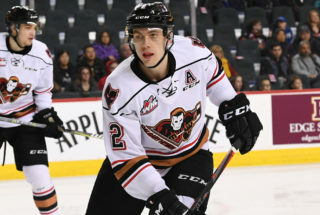 “It’s exciting because I watched the Hitmen my whole life and it’s unreal to put on that sweater now and even surreal just coming into the locker room. 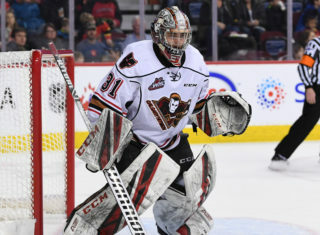 Being on the Hitmen also reunited the goaltender with goaltending and assistant coach Jason LaBarbera, as the two have crossed paths before and now get to work together. With just six games through the season, there’s still plenty of hockey left to be played and plenty of time for McNaughton to get in more games and develop furthermore.